How are you currently carrying your money around? Do you use a wallet? A money clip? One of each? Well, how you carry your money around is actually an important thing for a lot of people and money clips are starting to be one of the most popular methods of doing just that. The problem is that there are so many different choices that it can be difficult to choose the best money clips around. But we’ve started the process so you can just get to the fun part, picking your favorite from our money clip buying guide. 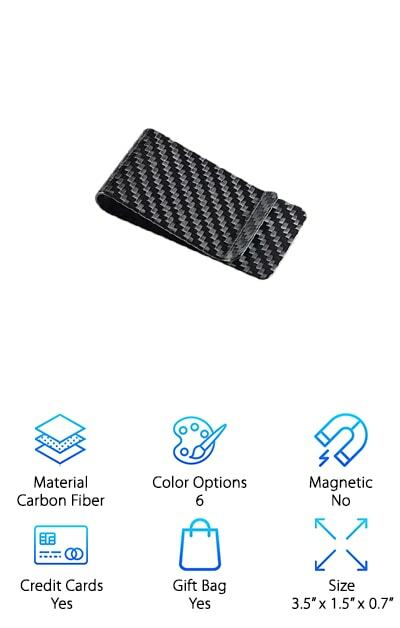 Material: Just like with anything else, there are different materials for a money clip, but most vary between leather or carbon fiber. The important thing is durability and the ability to stretch (though just a little) to hold whatever you need. 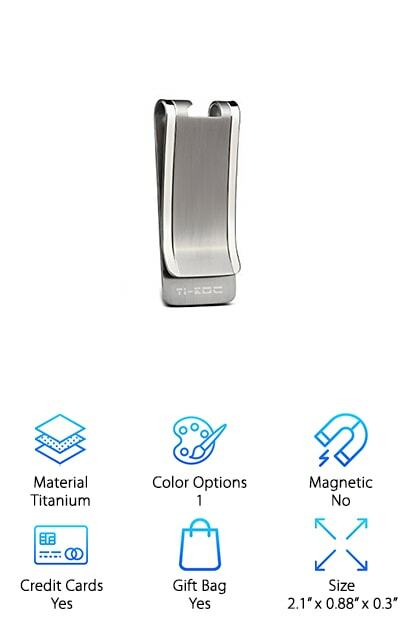 Color Options: Who wants to have a boring money clip anyway? You want something that reflects your personal style and taste and having several different color options gives you that. We’ll look at options that let you be more of an individual. Magnetic: Something has to hold your money clip together around your money, right? Well, magnets are one way to do that and can keep the money more secure. 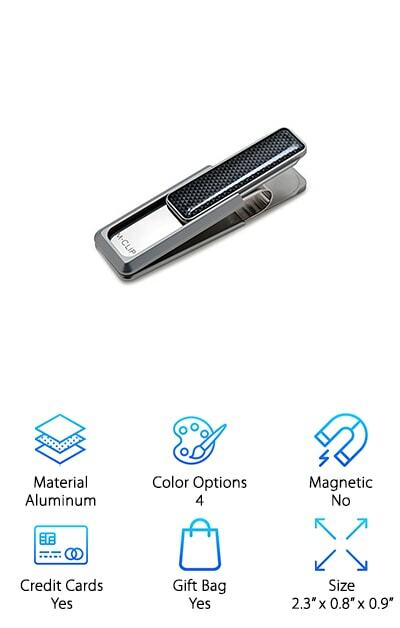 Not all money clips use magnets though, so take a look at your preference. Credit Cards: There may or may not be an extra panel to your money clip that lets you store other things. Some give you pockets for your credit cards or membership cards, while others leave you to find a different way to store other things. Gift Bag: If you’re giving your money clip as a gift you want to know how it’s going to look when it’s presented, right? Not all money clips are going to come with a gift bag but you want to know what you’re getting. Size: This is about how much it can hold as well as how large the physical item is. You don’t want a clip that’s too small to hold what you need it to and you don’t want it too large to easily fit in your pocket. Well, we know that there are a lot of different options out there and that’s why we’ve taken the liberty of doing the hard part for you. We’ve found 10 of what we think are the best money clips available. Even better, we’ve summed up just why we think they’re the best so you can skim through easily and make a choice. There’s a lot to consider (even if it may not seem like it for something so small) so take a look at these money clip reviews and let’s see what we find. Our top pick is the Vine Branch Money Clip, which is available in brown or black and made with genuine leather. This magnetic clip is super simple and small enough to easily fit in your pocket. Available with a gift pouch that makes it the perfect gift for your friends or family, this clip is lightweight and has top grain leather, which means that it’s durable and ready to stand up to just about anything, with enough durability to open almost ¼”. The classic style and the squared corners, as well as the neat stitches all the way around. make it something you can enjoy carrying around. Smooth all over, this clip can hold credit cards as well as your cash and doesn’t damage your phone, even when held in the same pocket. It’s just a little puffy on each side to add a bit of style and the softness makes it comfortable to hold and use. When it comes to our budget pick we like the Alaska Bear Money Clip. Available in both a shiny silver and a matte silver option, this clip is stainless steel and custom designed by the Alaska Bear company. Created with a super smooth finish it provides you with a stylish way to carry around your bills and credit cards. Even better, it comes with an elegant velvet bag that makes it a good way to give as a gift. Carry up to 15 folded bills or even 5 credit cards with no problem at all. This clip is easy to carry with the small profile and it still carries everything you’re going to need. No matter where you’re going it’s designed to be something you’ll love to show off. It’s also lightweight so it won’t take up much space and is strong enough to hold a minimal amount of material as well. If you’re looking for something that looks upscale the CarbonLife Money Clip is a great option. It’s made of 100% real carbon fiber, which means that it’s durable and will last for a long time. Not to mention it will hold everything you need whether you’re going about a normal day or you’re going on a special trip. Designed to always return to its original shape and available in six different colors, it provides you with a great looking tool to carry whatever you like. All you need to do is slip all of your money in and head out the door. When it comes to giving this as a gift you’ll love the nice box that it comes in and just how much your friends are going to love it. 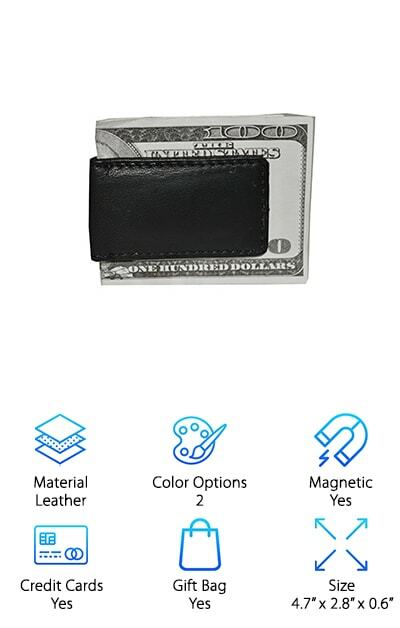 Lightweight and capable of holding up to 12 credit cards at a time (which makes it our best money clip credit card holder), it also fits easily into your pocket or bag. Available in either a black or silver stainless steel, the Sharkk Money Clip has a smooth finish and just the right amount of shine. It’s designed with a smooth finish and looks sleek no matter what you’re wearing or where you are going. If you’re looking for a nice gift this clip actually comes with a gift box that makes it perfect to give away as soon as you receive it. Small and lightweight, it’s still going to be plenty useful and you’ll be able to carry as much cash or credit cards as you need. 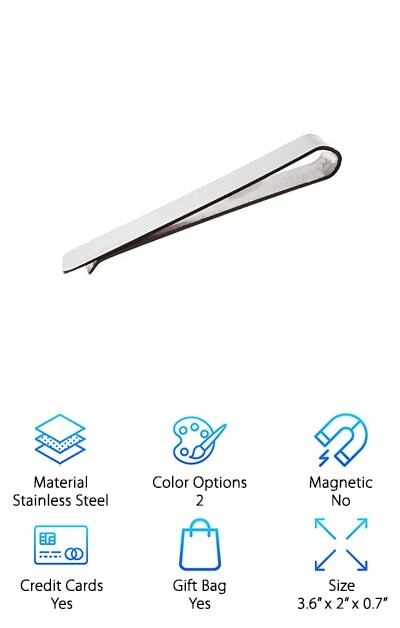 The clip is strong enough to hold only a couple cards or bills or everything you need with you without any concern for things falling out of it. It’s also magnetic, which helps hold the money in and can also help with attaching it to a wallet or anything else you need to carry, but it won’t hurt your cell phone. This makes it the best front pocket wallet with money clip we have here. The Y&G Money Clip is super stylish and comes in two different colors, at least for our favorite style it does. Available in a black stainless steel or gold you can get the look that you want with no problem at all. Small enough to easily fit in your pocket, this clip actually has a hinged opening rather than the magnetic or tight form of many similar units. This allows it to close tightly but still open plenty wide enough for you to get more in or to get the things you need out of it. 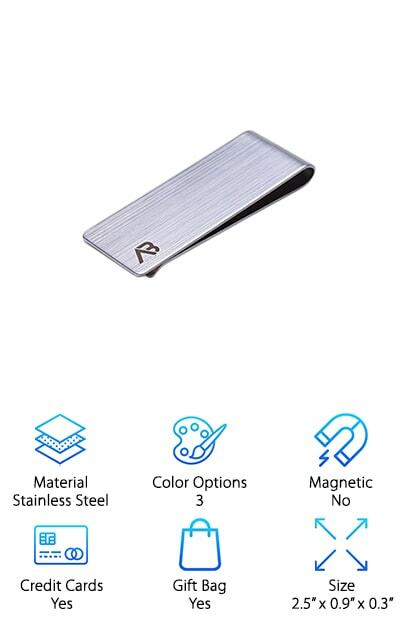 You’ll definitely find that this money clip can hold a lot and that it is very easy to use. You’ll be able to hold single bills or a larger amount of money with no problem, which makes it more versatile than some other options as well. The stainless steel material even works for engraving to make it even more unique. The Deluxury Money Clip Set actually comes with an entire gift set that you’re going to enjoy giving away to your friends and family. You get a money clip, tie clip and cufflinks all in one with a stylish gift box. They are made with stainless steel that means they’ll last for a long time and come with a 30 day return policy so if you change your mind or don’t like them for any reason you can get all of your money back, just like that. Small enough to fit in a pocket or bag, it holds all the money or credit cards that you will need during the day with no problem. The clip itself is spring loaded, which means that it fits directly to whatever you put in it, without having to worry about it getting too loose or falling out. It also has a stylish striped design that provides just a little bit of elegance without getting too much. The TI-EDC Money Clip has a unique style that makes it look great even when it’s empty. More than that, it’s lightweight but made from a titanium alloy. That means it’s even more durable than many of the stainless steel versions and that it can stand up to just about anything, including corrosion. It’s able to hold several credit cards or bills and it also doubles as your new favorite bottle opener (it’s right there on the end). There’s no magnet, which means that it’s not going to interfere with your phone or anything else you carry, plus it’s biocompatible, with a non-toxic design that’s safe for you and your family. If you’re not happy with it for any reason you can easily get a return and if you’re looking for a gift it even comes in a nice bag when it arrives. Plus it’s capable of being engraved because of the high quality titanium that it’s made from. The Leather Boss Money Clip is available in either brown or black to fit your own personal style. 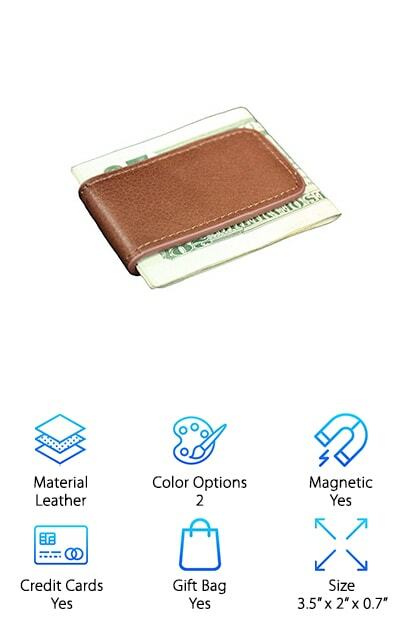 Made with genuine cowhide leather this leather money clip wallet super soft and durable, so it lasts a long time in your pocket or anywhere else. It’s handcrafted and has a classic clip design with the slightly puffy look and the elegant stitching around the side to indicate quality. It also has rounded corners and a slim profile that makes it fit easily where you want to carry it. The magnets inside mean that it clips strong around your money or credit cards but without causing harm to any of them. Even if you only have a few bills or cards the magnets pull the clip to hold them firmly or if you have a lot it can still stretch to accommodate them. 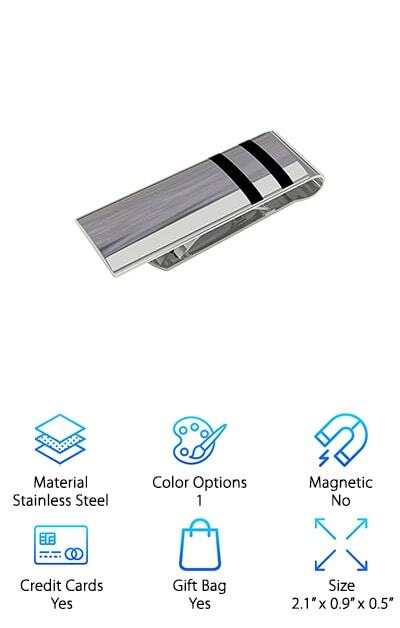 You can easily put this next to your phone without having to worry about magnets or any other problems, which makes it one of the best money clip wallet options. 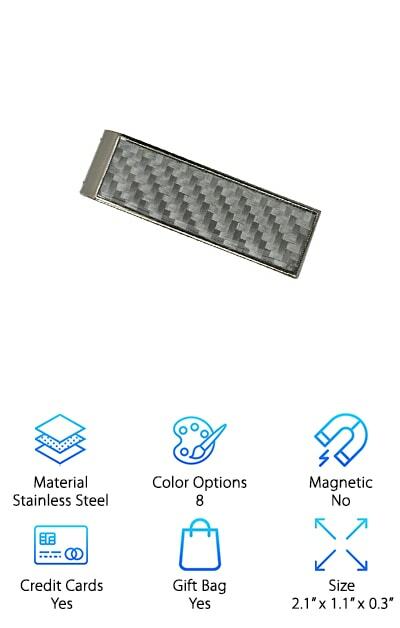 The Marshal Money Clip comes with several different unique design choices that are all made with a high quality stainless steel. That means that they are going to resist rusting and other damage while still keeping a sleek and stylish look for you to show off. They come with a gift box so you can give them as soon as you receive them and the options mean you get to show off your own personal style with no problem at all. Even better, they can hold a small number of bills or a larger amount of bills because of the clip design. There’s a smooth finish over the unit and it stays small to take up as little room as possible, making it more comfortable to carry around with you all day (or as needed). It looks good no matter where you want to go and it holds to its shape for durability. The M-Clip Money Clip is an extremely lightweight and small clip that still provides you with plenty of features and options. You can start by choosing between four different colors of this made in the USA option. You’ll get a satin finished anodized aluminum clip with black urethane accents no matter which option you choose. You’ll also be able to hold up to 10 bills and 7 credit cards at the same time, for the best money clip card holder. 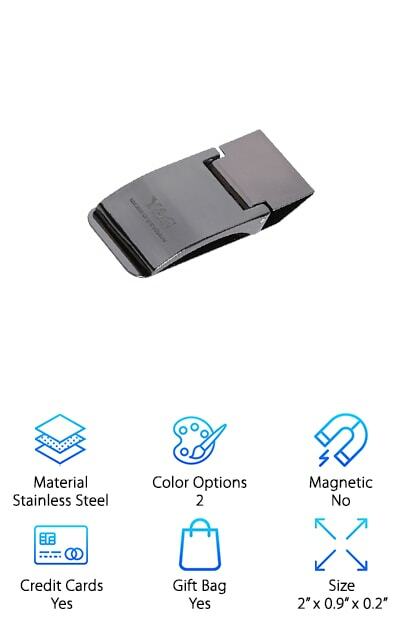 This clip comes in a gift box so you can easily give it away and has a slide function that helps to loosen it when you want to add money or take it out. When you do use the clip it holds strong so nothing is going to be lost or slip. Completely handmade, this clip is definitely capable of standing up to any kind of wear you might use and being one of the best men’s money clip wallet options.